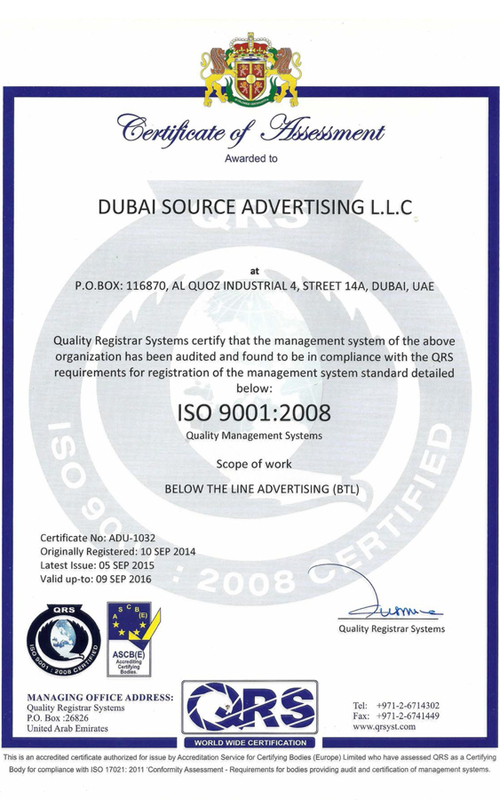 ESTABLISHED OVER 18 YEARS AGO, DUBAI SOURCE ADVERTISING IS ONE OF THE REGIONS LEADING ADVERTISING COMPANIES. OUR FOCUS IS CONCEPT DEVELOPMENT AND IMPLEMENTATION OF DESIGN SOLUTIONS IN THE MIDDLE EAST. OVER TIME, WE HAVE ADOPTED A PROACTIVE APPROACH TO OFFER SERVICES IN LINE WITH THE CURRENT GLOBAL MARKET REQUIREMENTS. A CLIENT-RESPONSIVE AND CONSUMERSENSITIVE PHILOSOPHY HAS HELPED US ESTABLISH AS A PROMINENT PLAYER IN ADVERTISING INDUSTRY. ONE OF OUR COMPANY’S GREATEST STRENGTHS’ IS A DEDICATED TEAM OF DYNAMIC PROFESSIONALS WITH COMPLETE HANDS ON EXPERIENCE IN aDVERTISING AND MARKETING SERVICES BUSINESS. tODAY, WE ARE AMONG OUR CLIENTELE A LIST OF BRANDS THAT RE THE MOST PRESTIGIOUS IN THEIR RESPECTIVE CATEGORIES AND AMONG THE HIGHEST ADVERTING SPENDERS LOCALLY AND INTERNATIONALLY. 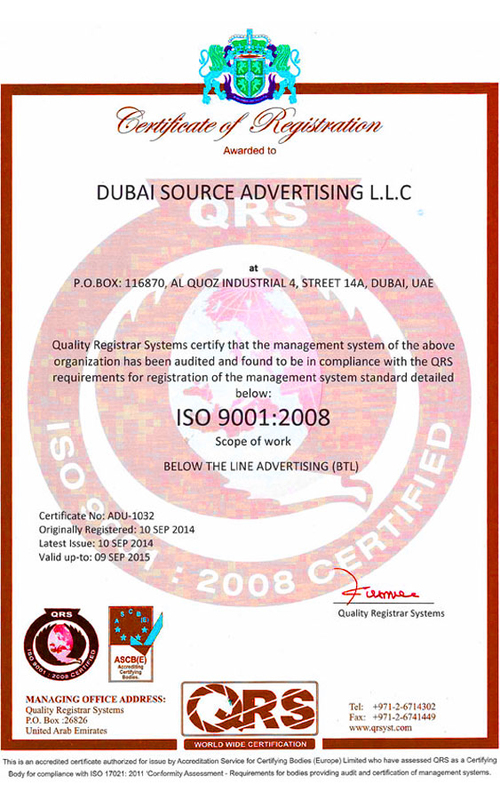 DUBAI SOURCE ADVERTISING SPECIALIZES IN THE PRODUCTION OF WORLD-CLASS EXHIBITION STANDS AND KIOSK,PROMOTION AND MERCHANDIZE STANDS, SIGNAGE, AWARDS, MEMENTOS, DIGITAL PRINTING AND POINT OF SALE MATERIALS. 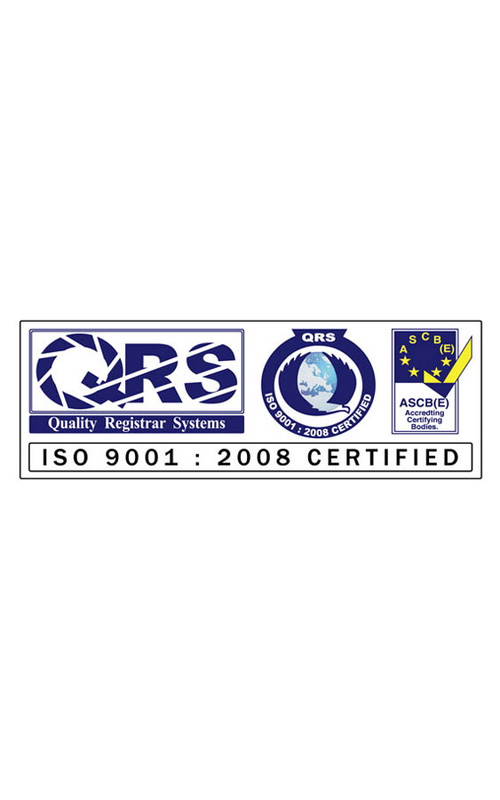 With an iso 9001:2008 CERTIFICATION ACHIEVED IN 2008, OUR COMPANY IS ORGANIZED AND HAS STREAMLINE ITS PROCESS TO ALLOW QUICK AND EFFECTIVE DEPLOYMENT OF THE BEST HUMAN RESOURCES FOR ANY GIVEN PROJECT.